In Outlook 2010, the detail level is selected from the Month button on the View section or ribbon. Expand the Month button to select a different detail level. The purpose is to give you an overview of your schedule on the monthly calendar – in High details, many users see as few as 3 or 4 events and appointments. 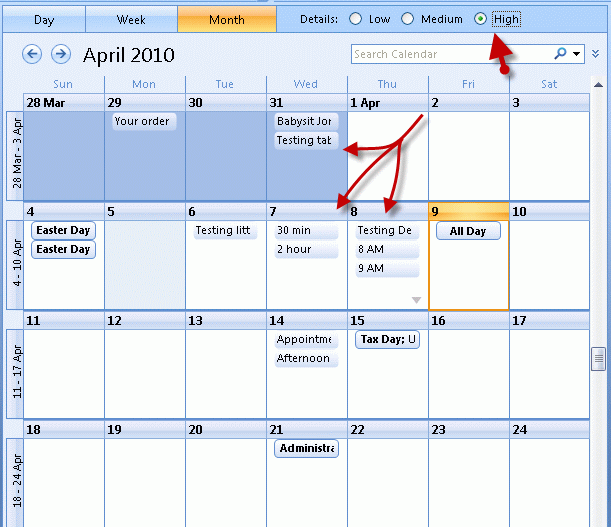 How many appointments and events you see on the calendar is controlled by the size of the Outlook window. At lower resolutions or when Outlook is not maximized, very few appointments and event display. Even at high resolutions, someone with a schedule full of short appointments may not see the full list on the screen. Using Medium detail, noon is indicated by a line across the center of the day, with timed appointments shown as lines above or below noon, so you have an idea approx when the appointment is. The thickness of the lines indicates how long the appointment is. This way a person can glance at the calendar and get an idea of how busy any part of any day is, based on the lines. For example, in the screenshot, there is a short appointment right before noon on the 7th and a longer appointment in the early afternoon. The 8th is fairly busy, with appointments of varying lengths throughout the day and little room for more in the afternoon. Morning appointments may be possible on the 8th. There are no appointments scheduled on the 9th, which has as an all day event. Published May 13, 2011. Last updated on March 31, 2016. Is it possible to change the monthly view so that no weekends display, just Monday to Friday days? No, sorry, not in the monthly view. You can put in a request at uservoice - https://outlook.uservoice.com/forums/322590-outlook-2016-for-windows - i searched but could not find a previous submission. I like to view the Monthly calendar in High Detail, but every time I navigate away from the calendar -- while still leaving it open -- it defaults back to Low Detail. How do I get it to stay on High Detail? It definitely should be on high by default. Have you tried resetting the view? When printing the calendar in "Daily Style" is there a way to get the details included? I do not want to print the "Calendar Details Style". In some printouts, it includes what you see on the screen - so if you can show details on the screen, they might be included in the printout. Otherwise you are limited to the options available in the print settings. That is not your imagination. The only way to make the days within the monthly view larger is to select 2 or 3 weeks in the navigation calendars on the left. It won't stick when you change views, but will give you larger cells. I have Outlook 2013 and, when I go to monthly view, the current month only appears blank. I can see appointments for past and future months, but not this one. Any suggestions? Reset the view on the calendar - View tab, Reset. This will clear any filters or corrupt views. How about less details in 2013, how do you get that? Any work around? I can't stand seeing so many details on my calendar... it makes it look like I am booked all day when I actually only have 1 meeting! You can create a filtered view to hide all day events but can't reduce the level of details like you could with older versions. There are two calendar views - the regular view and one called preview. Preview will show as much appointment information as there is room for - if you are using that view, switch to the Calendar view. The month view was how I looked at everything. If you needed more detail about an event or appointment you drill down. Taking away functionality like the level of detail because a few people misused the software is ridiculous. They have turned what I believe was their most functional part of the calendar into a cluttered mess! In a month view, who the hell needs to see specific location details? I want to look at my month and see the time and title of my appointments/events and that's it. I just was updated to 2013 and can't stand to high level detail. I agree with Darren 1000%.